Jeff Foxworthy & Larry The Cable Guy are no longer playing in Branson. Come out to Branson, Missouri for a night you are sure to remember; join comedian geniuses Jeff Foxworthy and Larry the Cable Guy as they treat you to a night of laughter, fun, and an all-around good time. Famous for his clean-cut style, Jeff Foxworthy brings his down home act to the Ozarks' back yard. Foxworthy is a jack of all trades, having penned eleven books and even earning the title for the largest selling comedy recording artist in history. With several Grammy Nominations also under his belt, he is sure to impress. Added into his repertoire include TV shows such as American Bible Challenge, Are You Smarter Than a Fifth Grader?, Country Countdown Show, and (most famously) Blue Collar Comedy Tour. 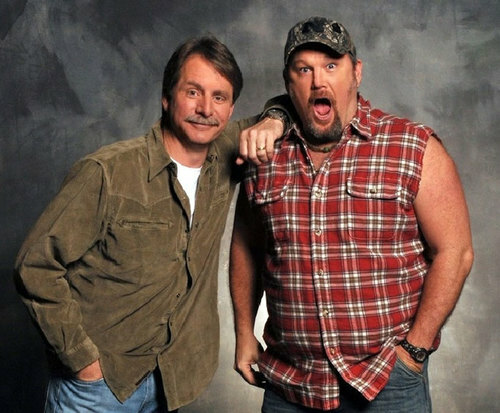 Having joined him on the Blue Collar Comedy Tour as well as the Country Countdown Show, it is no wonder that Foxworthy and Larry the Cable Guy are two peas in a pod. Larry joins him with his 'redneck' themed jokes and catchphrase of 'Get 'er Done'. Dressed in his signature cut-off and ball cap, Larry the Cable Guy complements Foxworthy's set, and with a great history between them, the onstage chemistry is sure to impress. Make sure you head to Branson to check out this dynamic duo in action; you will not want to miss out on these comedy connoisseurs together in the Ozarks' back yard. Really enjoy our trip to branson. Fantastic show! These two will keep you laughing the entire 2 hours. We loved the show had a good time but the people next to us where using their phones through the whole show very distracting they tell people that they can not record or take pictures but i guess grownups don't have to listen we did enjoy jeff and larry very much.